Chemical Peels - Good or Bad For Your Skin? Chemical Peels – Good or Bad For Your Skin? Everyone desires smooth, flawless and wrinkle-less skin. The largest organ of the body, your skin, is constantly inundated with dirt, chemicals, ultraviolet light, and a slew of other hazards. Proper skincare is an essential aspect of preserving your skin. Chemical peels are sold as an affordable treatment option with lasting results. But are they safe? 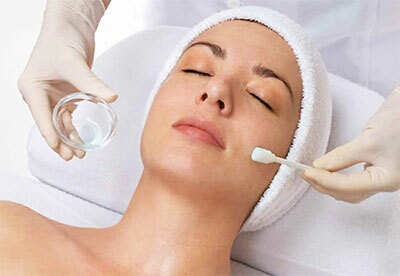 Chemicals peels are methods or procedures used to impart glow to the client’s skin. The three types, superficial, medium, and deep, are used depending on the client’s individual needs. The chemical peel solution, mainly comprised of acids, can sit overnight or may be removed within minutes after applying. Following a chemical peel the treated skin will typically flake between 2 to14 days. The underlying skin appears healthier and more polished with an enviable, dewy glow. Chemical peels will undeniably yield effective results but be sure to understand the pros and cons of this procedure. Chemical peels can successfully treat many skin problems including fine line wrinkles, sun damage, acne, liver spots, and scars. Chemical peel can improve your skin texture, tone, and reduce fine lines. Deep exfoliating treatments can help in removing pre-cancerous growth. This prospect must always be explored under the supervision of an expert dermatologist. Chemical peels are customizable depending on the client’s particular skin type. Serious side effects of peels are rare. Chemical peels are usually very effective and useful for the people who want to get rid of skin acne, damage to skin related to ultra-violet exposure, and scars. Chemical peels need special precautions after the procedure. Following a treatment you should be extra protective about your sensitive skin. Precautions typically including avoiding direct sunlight, avoiding applying any other chemicals to the skin, and restricting exposure to dirt and dust. Failing to follow post-peel instructions can result in lasting skin damage. In rare cases these treatments can cause infection and damages to skin. These problems can include itching, scarring, age spots, etc. For people with extremely sensitive skin, deep exfoliation can result in side effects like redness, sensitive, inflammation, and burning. However, these side effects are usually temporary and subside after some time. Do not attempt chemical peels unless you are sure of your tolerance to any particular chemical peel treatment. Is a chemical peel right for you? Contact an esthetician at Skin Therapy Studio to find out!